From an idea to a design, comes easy communication and a quality build – we’re with you every step of the way. Taking measurements from your home, we’ll create awe-inspiring designs that meet your budget. The hardest part will be to pick your colors. By keeping our overhead low, we’re able to offer extremely competitive and affordable pricing for both small and large decks and patios. 100% financing is also available. Designing and building custom decks & patios in the Greater Metro Detroit Area. Have an idea on what you want your backyard retreat to look like? Have no idea? That’s ok! We’ll work with you to create multiple designs specifically for your home and your wants-list. See what your deck or patio will look like in 3D before a contract is even signed. Take a look at our process here. Add a deck to your new construction home, extend your existing home with a new deck, or transform an existing deck with new decking and new colors. We build everything from small walkouts to large two story decks. Enjoy the highest ROI of any home improvement project by adding a deck to your home – most homeowners recoup 80% of their investment when it comes time to sell. Want a maintenance-free deck for 25 years? You’ve come to the right place. Patios are perfect for a fire pit, grill, or extra seating space. Add a standalone patio to your backyard, or extend your home or deck with a paver patio or stamped concrete patio. Have a deck you’d like updated? Get a new look without the expense of replacing the entire deck. We’ll salvage what we can and rebuild what’s needed to ensure a code-compliant and safe deck. An astonishing 50% of existing decks aren’t built to code. Unfortunately decks improperly built can collapse and cause injury. Decks older than 5 years need to be inspected every 3 years. We offer no-charge deck inspections – call or email us to set up an appointment. Questions? Concerns? Want to work with a contractor that actually responds to your calls and emails? We’ll respond to all calls and emails the same day. Or directly call the owner, Phil, throughout your entire project for any reason. Phil’s direct number is (734) 931-6700. We’ll meet you at your home to draft 3D renderings of multiple deck and/or patio designs specifically for you and your home. We’ll bring sample materials for you to choose from to create a beautiful, functional addition to your home. All with no commitment and at no charge. By streamlining our workflow to reduce company overhead, and by partnering with the best suppliers in the area, we’re able to offer extremely competitive pricing for your custom deck or patio. Exclusive financing options are also available. Decks and patios installed the right way to last your family for generations. We build not only to exceed code, but to meet our own stringent quality checks. We’ll also secure the permit, HOA approval (if applicable), call Miss Dig, and coordinate inspections – we take care of it all. We build with the top of the line capped composites including Trex, TimberTech, Azek and Fiberon. We include extras in the base such as custom railing options, waterproofing sealant, and corrosive-resistant hidden fasteners. We stand behind our work. That’s why with every deck we install, you’ll get a 25 year manufacturer warranty, plus a 3 year workmanship warranty. 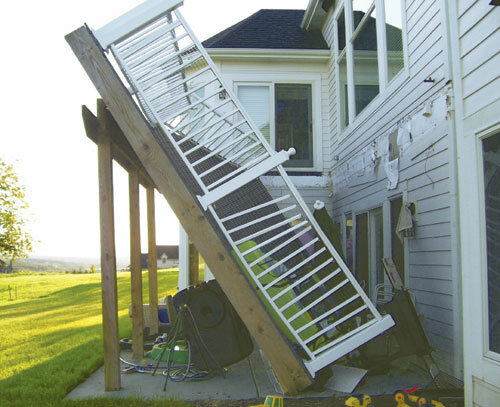 If anything happens to your deck, call us and we’ll be there to fix it. We’re a licensed and insured local Michigan company. No more sanding, painting or staining – EVER. Your deck stays looking brand new year after year. New capped composite decking prevents mold, mildew, staining and fading. 25 year manufacturer warranty included with all installs. No Sanding. No Painting. Ever. But What Does “Maintenance-Free Decking” Really Mean?